We have expanded our network with a high-quality partner: Our location tags are now integrated into mobile terminals from Cognex. This means that customers with this hardware can also use our solutions in the future. In this newsletter we look back on a successful LogiMAT, in the tip of the month we present new functions in CargoVIS and introduce our colleagues from the assembly and commissioning. DIVIS joins forces with LogCoop GmbH, the logistics network for medium-sized companies, to open our solutions to these companies. Don’t miss out on meeting us at the LogiMAT 2019. Learn more about how to create and edit your own live views in CargoVIS in the tip of the month and get to know the colleagues in our service team. 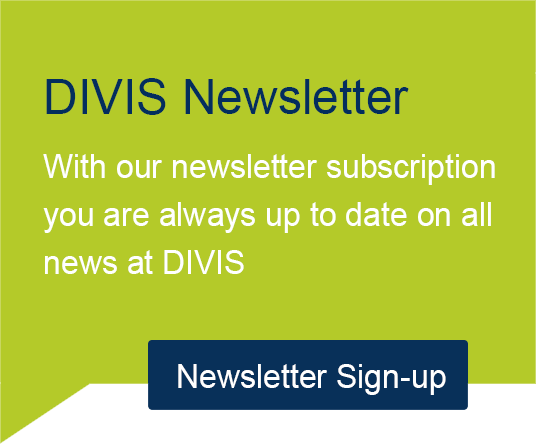 In our first Newsletter 2019 we inform you about our planned live presentations, we have a new tip of the month and introduce you to our colleague Christian Meßner, who takes care of the work preparation of the projects at DIVIS.